They are short snippets of time that come and go with us scarcely noticing. A teachable moment is an opportunity for sincere praise, nuggets of wisdom as well as for living in the transparency of asking forgiveness when you mess up as a parent. These opportunities are abundant for eyes that are looking and waiting for them. Grab some of them and shape a character today. 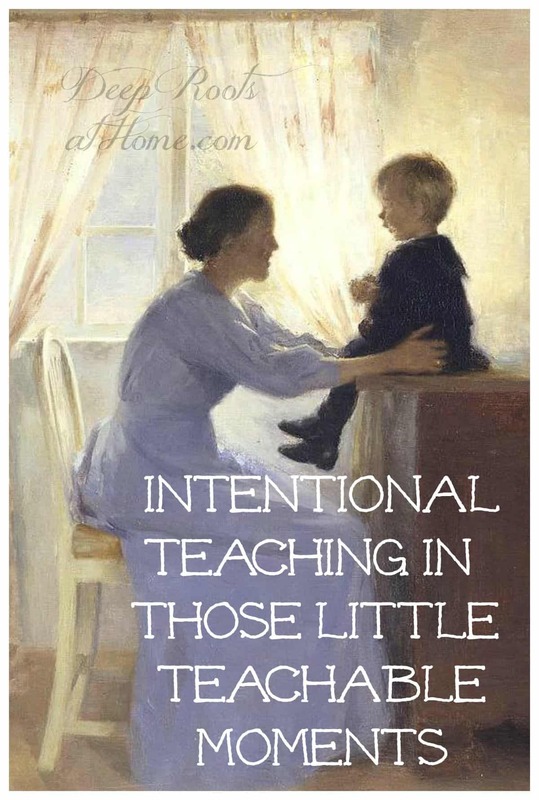 An intentional mother or father can weave edifying conversation into daily life to help her young children recognize a biblical or practical life principle and connect it with what is happening right now in their world. Without being preachy, teach some small principle you have read or been pondering lately. Do so while you walk, drive, eat, sit, or play, and encourage their questions and asking questions. You never know when God will give you an life-changing opportunity to imprint His values on your children. A dad and his 3 children went to the hardware store to get material to build a small doghouse and found a billfold in the parking lot. The billfold had money in it but no identification. His children witnessed the event, and the father could have left the matter there but chose to talk about it instead. Over dinner later that evening, they discussed the virtue of honesty and why the father turned in the money instead of keeping it. He wasn’t trying to impress them with his virtue; he was impressing on them biblical truths. Perhaps they would have learned the lesson just by watching, but he couldn’t be sure without asking them what they were thinking. No one got a lecture; no one left feeling inadequate, overwhelmed or bored. It took only a couple of minutes to make the point: “Each of you should look not only to your own interest, but also to the interests of others” (Philippians 2:4). Even though I was committed to do everything right as a parent, I failed. As hard as I tried, I didn’t give them the perfect world I wanted to provide. I found over and over I had to confess I was wrong about something or had a bad attitude. It was very humbling, but I knew I needed to model it if our children were to learn it. By admitting our need for forgiveness when we sin, it helps our children to do the same when they sin. A parent who is unwilling to admit her own failures builds a thick, terrible wall of hypocrisy before their child. It will inevitably lead to that child’s being unwilling to be transparent with us when they fail as they get older, and we will not have a remedy except by the grace and mercy of God. Using the sins of our past can be a way to teach about the curse of sin. We can consider this with discretion and prayer (and age appropriateness). Explain how you learned the hard way. Tell them about how that sin has haunted you. Get them to understand that doing the things you did has left scars, and wounds that may never completely heal. If it is a serious failure – like my abortion (of their baby brother or sister) – you may strengthen your children to refuse future temptation in their lives. Don’t try and hide it. That may give them fuel to use it against you later in life if they do discover it on their own. Our children would often want to talk when we would tuck them in at night and pray together. By just listening and being close, even though we were tired, we connected with their hearts and they with ours. I tried to make mental notes of misinformation or a concern they had. Sometimes it was small enough to be worked through right then and prayed over, but other times, it needed to wait until they (and I) were more rested. Often my perspective was healthier in the morning after a good nights sleep. In later years when the size of our children’s challenges centered more on personal development and others outside the family, I continued listening. Some of our best talks/listening were late into the evening. Only if I received what they had to say calmly without rushing to conclusions, or getting angry, would they continue to want to talk. I had to grow in my reliance on the Lord because my own answers were never enough. I needed to stay in the Word so I could have direction when those teachable moments or questions came. Capturing teachable moments is not a formula to producing perfect children. In the job I am willing to die for – the job I want most to do well (second only to my marriage) – I am still learning that there is a huge difference between parenting children with formulas vs trusting Christ to show you how to teach your children. Dear Mama, trusting the Lord is everything. In those teachable moments, let your children know the best place to take a problem is to their heavenly Father. Yes, you do have to be careful and use wisdom when teaching your children using something from your past. I always told my children that a smart person learns from their own mistakes, but a wise person learns from the mistakes of others. Oh, that is SO good! I will remember that. Thank you. Yes, Susan, I am a bit hesitant to tell others to tell their children about the mistakes in their past. It was so terrible to have to talk about them in my/our past, and it was SO delicate. Only by the grace of God and much prayer! Enjoyed very much reading this what an encouragement and great reminder! I need so much wisdom right now for major difficult decisions. This is just what I need to see once again. I love you in the Lord, sister! Thank you! Oh my, so very true. GOD BLESS!!!! This has been one hard day. Please pray for me. Thanks! Oh my, I know I missed a lot of those moments, too, but I’m thankful for the ones I didn’t miss. Thank the Lord for taking up the slack where we fail. Great encouragement for mothers, Jacqueline. I agree we have to let our children know that we have made mistakes and the we have learned the errors in our way. I also think we need to teach them the act of forgiveness, and letting go of ours and others past mistakes. God forgives and so should we.